The question being bantered about lately is whether luxury brands need a history to indeed have a future. The concept has many focussing on legacy whether they themselves have one or not. There are those merely alluding to a suggested fictional past and then there are those who can actually lay claim to true heritage. Lalique is clearly the latter. A name that has always been associated with creative luxury, Lalique has been gradually updating its august image and reestablishing itself as a significant player in the field. With archives filled with inspiration, Lalique is finding exciting ways to reinvent its classics for a new generation. Although perhaps better known now for his sculpted crystal creations, René Lalique’s talent originally manifested itself in his Art Nouveau and Deco jewelry designs. Influenced by the majesty of nature in all its forms, he blended symbolism and naturalism, incorporating many materials not normally associated then with fine jewelry. Horn, glass, enamel and ivory in addition to gems were used as vehicles to enhance the value of the piece as an artistic entity. This innovative approach was a novel concept and by the turn of the century (1900), Lalique was considered one of the greatest jewelers of his time. 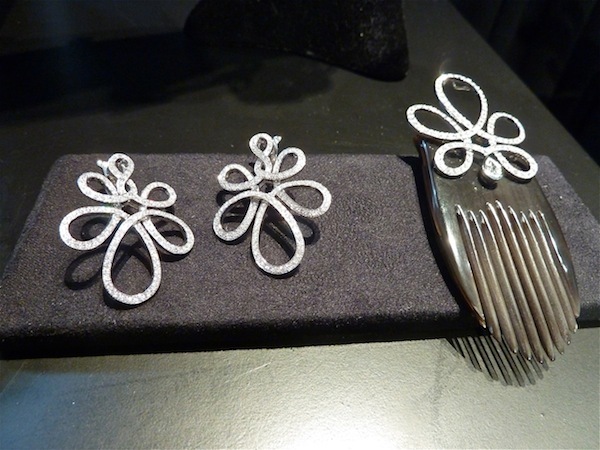 Lalique recently launched its first fine jewelry collection in over a century, reinterpreting its founder’s vision. Based on the four elements of the natural world – water, air, earth and fire, the initial introduction was Eau Sensuelle, inspired by the sensual qualities of water in all its forms. The mythological story of the water nymph Aréthuse who was transformed into a fountain by Artémis to fool Alpheus, her suitor, was Lalique’s inspiration for his famous “masque de femme,” whose image is included in the pieces above. 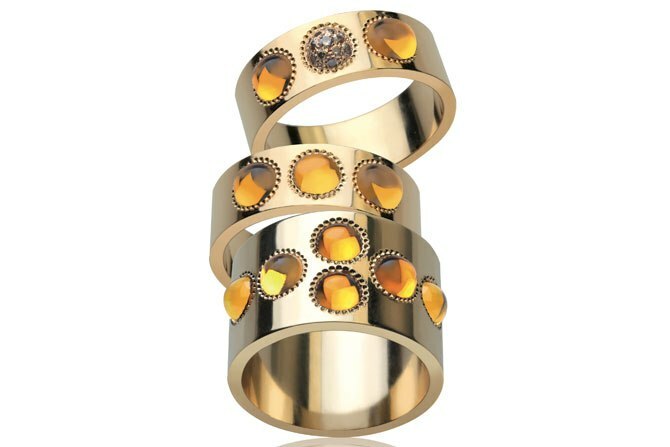 Another star of the collection is Pétillante (sparkling) translated into these elegant yet modern rings, whose cabochon amber crystals and champagne pavé diamonds suggest dew drops and light on water. 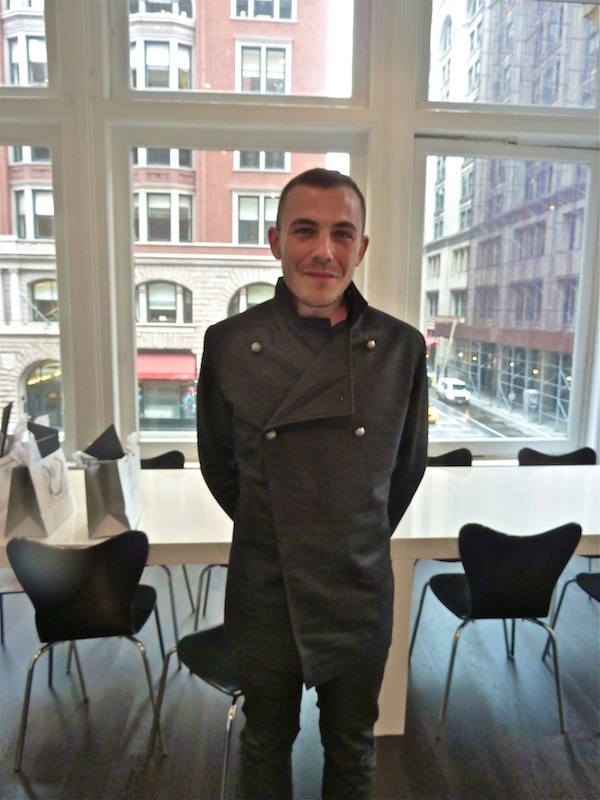 I recently paid a visit to the Lalique offices where I had the opportunity to meet the company’s talented new jewelry designer Quentin Obadia and see some of the pieces in the latest collection, l’Odyssée du Feu Sacré (The Sacred Fire Odyssey). These pieces represent a journey, an odyssey in which, like the Phoenix, the creations of the master have risen from the ashes (or archives) and are reborn in a modern incarnation. The muse of the collection is Vesta, guardian of the perpetual fire, representing the passion of love and home. The amazing centerpiece of the haute joaillerie collection started as the sketch above, resulting in the spectacular one of a kind creation below. 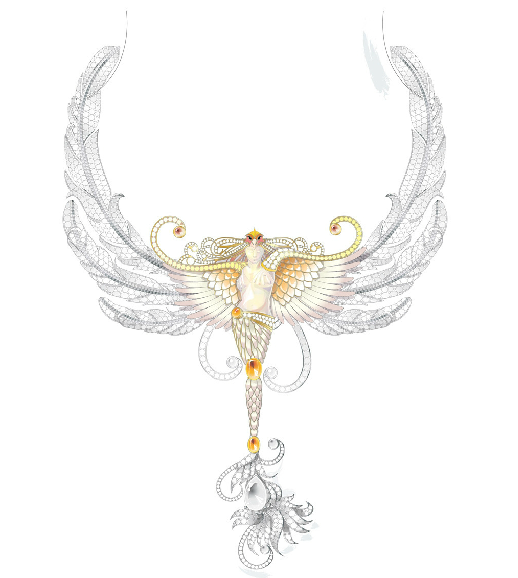 Staying true to the legacy of Lalique, the necklace mixes crystal with precious and non precious jewels – mother of pearl of the wings, fire opal and diamonds with a 3 carat pear-shaped stone in the center of the bottom plume, detachable as a pendant. The piece is articulated and adaptable to be worn in four different ways. The tiny crystal body, made in the Lalique factory, was a challenge for the workers used to creating larger works, but Obadia wanted to have the continuity and same level of craftsmanship entrusted to the rest of the label. Within the collection are also “the Songs of the Sacred Fire Odyssey,” groupings of wearable contemporary pieces, representing Lalique’s “poetic recreation of the world.” This is a world, like the original collection, in which nature, nymphs, goddesses, fairies, flora and fauna are transformed into exquisite handcrafted jewelry in the firm’s Paris studios. The beautiful Ardente grouping, entitled a Form of Fire, incorporates Lalique’s original graceful arabesques. The graceful symbol of eternity is so modern in its elegant simplicity. The comb pictured is part of the 1888 collection, dubbed Ornaments of Fire. Combs were an integral part of Lalique’s oeuvre and eight original designs from 1888 are reinterpreted for contemporary collectors. Below, two more beautiful Ardente combs. 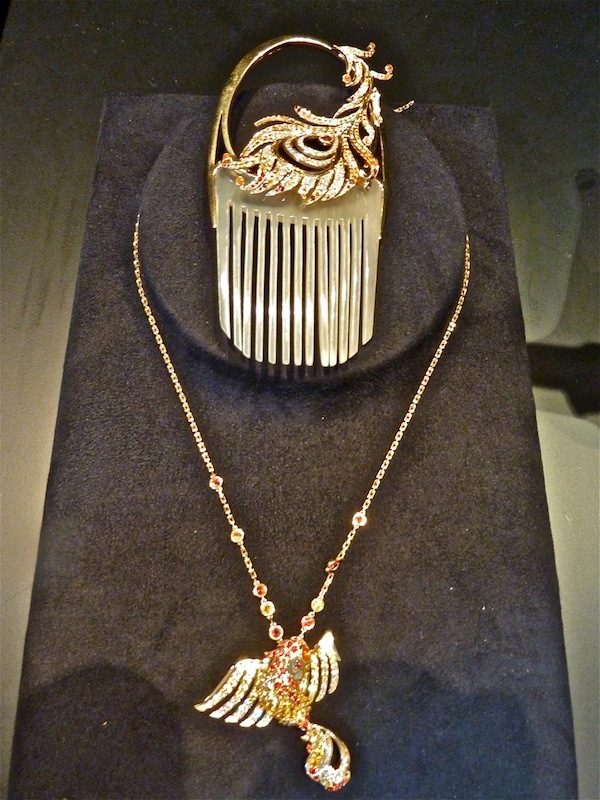 As with all the combs, the Phoenix (shown with its coordinating pendant) is detachable to wear as a brooch. 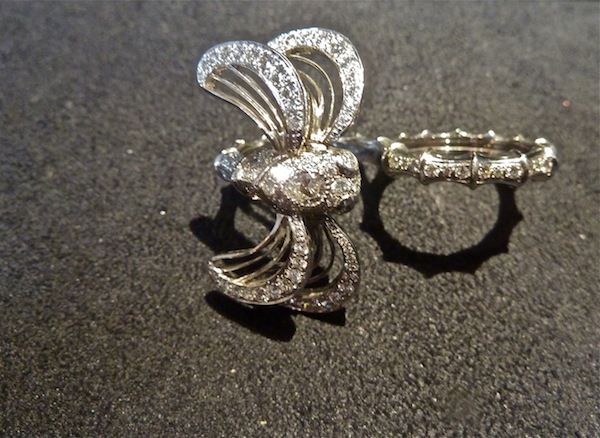 I loved this Diamond Dragonfly ring, part of the Fauna of Fire group. Cleverly designed, it sits comfortably between the second and third fingers. In white gold with pavé diamonds, it is both delicate and significant, a modern concept incorporating old world craftsmanship, a bridge between the roots of the legacy and a contemporary lifestyle. In another more colorful incarnation, this Dragonfly ring is equally arresting. 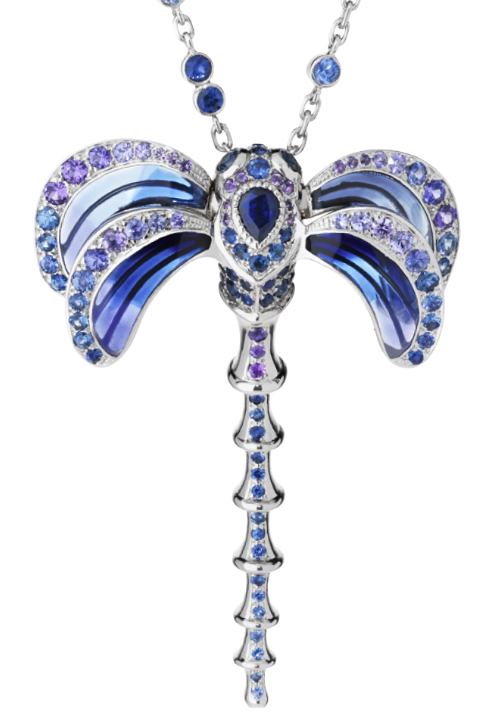 As is a gorgeous pendant in white gold and sapphires. This is a collection about emotion and poetry, about a love of nature, mythology and the female spirit. With an innovative mix of materials and timeless craftsmanship, a new future is forged for this legendary label. More jewelry collections will be introduced later this year and you can anticipate more unique pieces, many at approachable price points, inspired by the past with an eye to the future. Do come back tomorrow when we look at how Lalique is rejuvenating itself in other venues as well. This entry posted in design, gifts, interior design, jewelry. 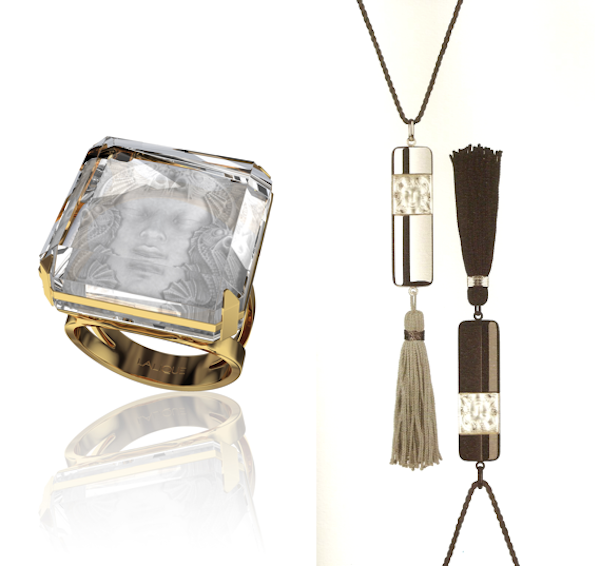 Entry Tags: Crystal, fashion, Heritage, Jewelry, Lalique, Luxury, New Lalique Jewelry Collection Bookmark the permalink. Wow, these are all so beautiful!! 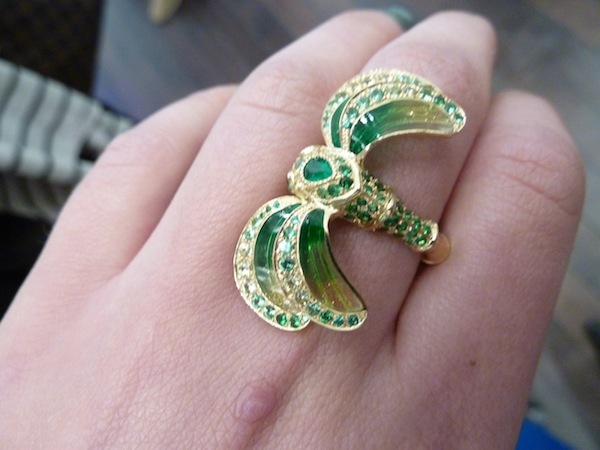 I love that dragonfly ring, in the emeralds and the diamonds!! What I wouldn’t give to have one!! Lalique has stunning products!! I have a mouth full of adjectives and none seem right. I would love to see these pieces in peson, each a work of art. The ring absolutely looks like a face under water, amazing. This line of jewelry, just as their beautiful collection of crystal pieces, is stunning. A piece of Lalique crystal is truly a prized piece of art, and this new jewelry collection will also be an addition to ones heirloom pieces. What a fun visit and loving those rings! Such beautiful piecces and I love the ornaments of fire earrings. The dragonfly double ring is amazing! Absolutely gorgeous pieces! Just amazing, what gorgeous pieces! Especially those combs and rings. Thanks for shedding some light on the history of this company and what they are currently doing. What a stunning collection of beauties and I’d snap up that dragonfly pendant before it flew off! We were once asked to pour one of our bouquets into a Lalique vase and had to refuse – why interfere with such perfection! White gold – you’re singing to me! 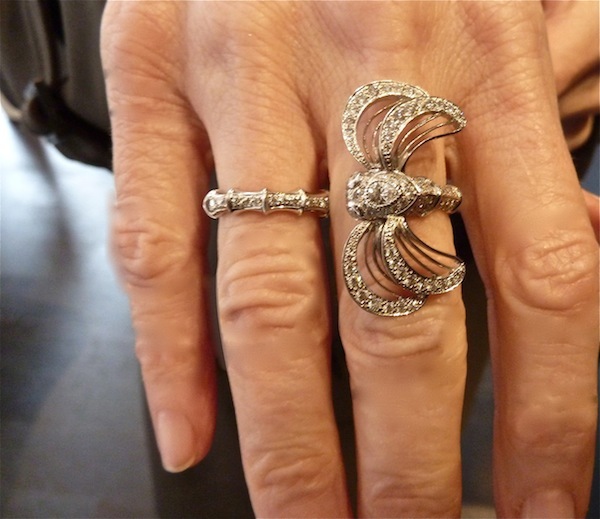 The ring and dragonfly necklace – love! Beautiful review! Lalique c’est magnifique. I know its hard for you to look at jewelry :). You’ve out done yourself in writing. I’m envious. Hope you are doing well. After nine days looking after my 90 year old parents who were in a nosedive, I’ve been exhausted, not to mention injured from having to lift my 6’4″ Father out of the car. So far everyone is hanging in there! Poetic artistry for sure. Lalique is creating more than jewelry…..but a legacy for future generations. Obadia’s work is amazing! 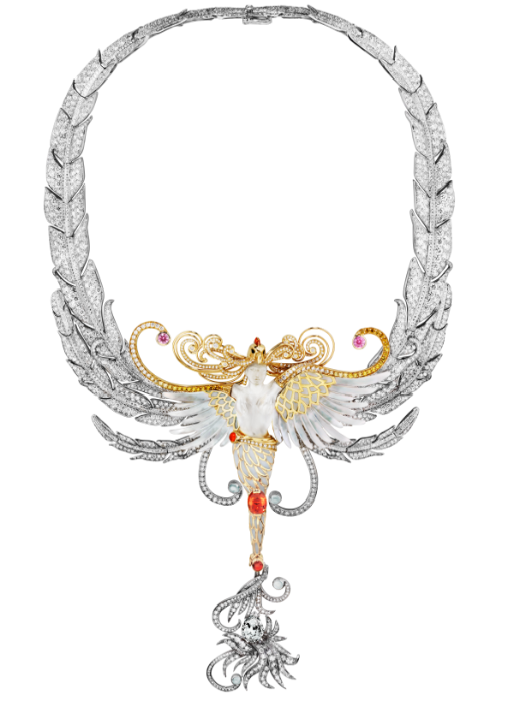 The l’Odyssée du Feu Sacré necklace is so intricately divine, incredible! What a terrific post about true heritage. I think the Pétillante rings are a must-have!!! Couldn’t agree with you more regarding Lalique’s unique heritage. 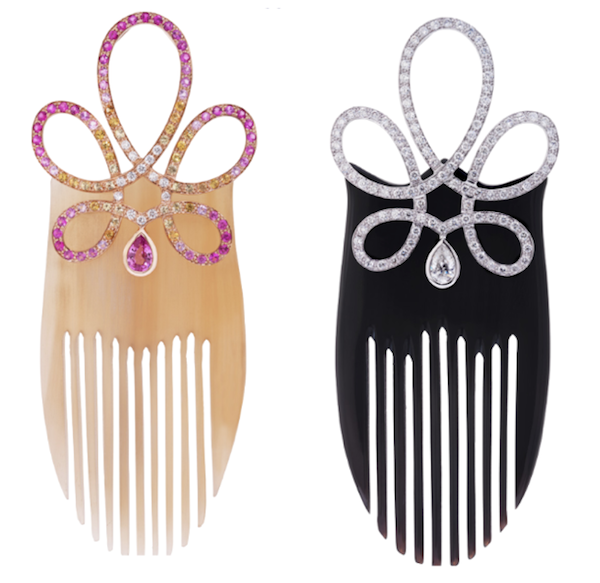 I haven’t’ seen the Ardente combs – they’re stunning! 79 queries in 0.505 seconds.